Natural Gas from the North Sea finds its way through production platforms and pipelines to onshore facilities where it is further processed and distributed. The gas pressures in the reservoirs vary depending on the original source pressure and the amount of gas produced. Producing natural gas seems straightforward, but quite a few special techniques are involved. It not only involves working at sea, although in reasonably shallow water, but the reservoirs are deep, the pressures are high, and the gas is not clean. Besides, there is a lot of salt present, which can disrupt work. That's exactly what a major Oil & Gas producer in the Netherlands experienced. The outflow from a producing well is continuously monitored, resulting in a well-production trend graph, which shows any irregularities. In some wells, salt crystals form and grow around the well outflow opening, which can cause an irregularity. To address this problem, the Oil & Gas producer started a project. The most obvious solution is to wash away the salt by using pure water. A feed pressure of 550 bar is required, not only to be higher than the pressure of the gas but also to bring the water to the other end and still be able to carry out the flushing action. At the same time, it is necessary to know that the water is flowing in the right direction and in which quantity. The flow rate is therefore an important variable and needs to be properly and reliably measured. The producer aimed for accuracy of about 5%. However, the measurements are complicated due the high pressure and relatively low flow rate, as well as by the fact that the producer couldnt use flanges in pipes with a diameter of less than two inches. 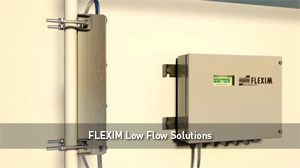 That only left one option: Non-intrusive ultrasonic flow measurement with FLUXUS. By using the FLUXUS XLF low flow meter, high pressure is not a problem and low flow velocities can be measured accurately. A flow of 230 litres per hour at a pressure of 450 bar are typical values, measuring clean water in a pipe with an outside diameter of 38 mm and a wall thickness of 13.7 mm. In order to achieve the highest possible accuracy for this specific low flow application, the decision was made in consultation with the producer to calibrate on a pipe section from the same batch as the gas pipes on site. A default calibration was carried out against the flow standards at the lowest speed of 0.1 m/s against the weighing device, a primary standard. Ultimately, this resulted in measured values with a maximum deviation of 2%. A check was subsequently carried out to see whether the repeated disassembling and remounting of the flowmeters influenced the accuracy. That was not the case, the measured values and deviations remained unchanged. This shows that even when mounted on location, no greater deviations than 2% can be expected, which is significantly lower than the required 5%. So FLUXUS complies very well with the specifications. Currently, the equipment has been built into the installation and the commissioning procedure has been completed. Early results are very promising and provide the producer with complete measurement confidence.